Details magazine has a hot trend alert for all you self-conscious dudes out there: Guys are drinking rosé now, and they’re not even embarrassed about it. Well, male or female, we can all agree: Rosé is great and should be enjoyed by all. You know what? Good for them. Rosé is great, and we are in prime season for the dry, sweet wine. Pop on a pink polo while you’re at it. No one sitting outside in June is jonesing for a full-bodied Malbec and a bowl of chili. Hell, no! Those types of food and drink conduct heat. In the hotter months, you want light wines and oysters. Rosé is light and crisp and matches the weather and (hopefully) your mood. In fact, rosé is best enjoyed en plein air. Of course, this particular beverage has always battled perception issues. 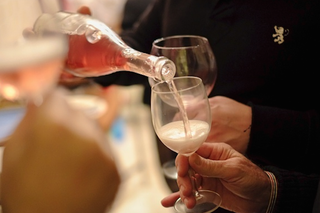 That may be because the first name in pink wines has historically been White Zinfandel, made popular in the 1970s by Sutter Home, those California-based purveyors of grocery-store wine. This wine became insanely popular throughout the ‘80s, but it’s generally made using crappier grapes, so wine-heads don’t necessarily take it seriously. Also, rosé is one of the major products that comes out of the Provence region of France, a place that all women ages 45 and older agree is great and cool to visit during Lavender season. Don’t believe me? Call my mother! But allow me to offer a personal anecdote. As a kid, at the lakeside cabin we’d visit out in the country, I used to have a neighbor named David who would drink wine out of a red Solo cup as he stood out by a retaining wall on his property that overlooked both the water and his own large belly, the type that is only caused by extreme levels of alcohol consumption. In that red cup, David would drink a mixture of white and red wine. He called it “blush.” Say that again in your head, but with an East Texas draw, just to set the mood. Now, what he was drinking definitely wasn’t rosé in the traditional sense of the word, but David was not afraid to throw back some pink wine and yell at people for driving their boats too fast. He was a man’s man, and secure in his masculinity. So, in turn, it’s good that men of this generation are realizing what so many of us already knew. The rapper Rick Ross claims the nickname Rozay, which, I like to think of as a partial tribute to a certain rosy-colored drink. The Bawse lives a good life, and most likely has known what is up for a very long time.